Any good wine reflects the weather, which is the work of nature, and it was especially beneficial in 2009, here in the Beaujolais region. Things got off to a great start in May, which was lovely and warm with plenty of sunshine. The vines were nearly growing before our very eyes, and this soon led to them flowering. This told us that the harvest would be early (90 days after flowering). In late July, one winegrower said to me “My grandfather used to say that August is always just like May” and his grandfather was right this year. We had the sunniest August seen in the last sixty years and, record temperatures were recorded between the 20th and 30th of the month – on the ground beneath the vine stocks, we recorded 42° in the shade. We took 1° by volume every three days. September applied superb finishing touches to the maturity of the grapes, causing them to set new records in excellence. In addition to this – and this was decisive in rounding off the quality of the grapes – our vines were in the best possible health; there was not a single blemished grape and not even a hint of midges either on the vines or in the vats – something which had not been seen by winegrowers in living memory. So it is hardly surprising that the 2009 vintage offers a whole host of aromas, with a mixture of scents of black fruits, including blackcurrants, blackberries and blueberries, together with vanilla and mocha. In the mouth, it breaks down into a fabulous fullness, a perfect smoothness, an excellent density, a great deal of texture and concentration. It has elegance as well as distinction, making this a truly excellent vintage. Indeed, this is the best vintage of my life! The very word “Beaujolais” has something magical about it. A charter dating from 878 confirms that properties including vineyards in the village of Bogenis (a Celt word meaning “fine white bull”) were owned by the canons of Saint Vincent. Bogenis was later latinised and became Bellibocus, then Beaujeu and finally Beaujolais. The “Beaujolais” regional appellation was recognised in September 1937 and is both the most emblematic and the largest, accounting for approximately 40% of annual production. The vines are grown on clay-lime soils, i.e. sandstone, white limestone and limestone with Gryphaea. The Pays des Pierres Dorées, which lies on the southern edge of the Beaujolais region, is made up of a patchwork of hills with harmonious slopes and green valleys, just 20 minutes from Lyon. The region is full of sumptuous landscape and treasures of all kinds. Above all, the secret which makes it so very special is its «pierres doree» (golden stone) which gives to its houses and old market towns such character; in fact the region looks a little like Tuscany. The “Beaujolais Nouveau” appellation first appeared in 1951 and was the first wine to launch the fashion for “primeur” wines; it plays an essential role in promoting Beaujolais as a whole. Beaujolais wines have a sparkling carmine red robe. The nose offers a generous aromatic range of red fruits (strawberry, raspberry and redcurrant) set off by notes of liquorice allsorts. In the mouth, the wine is full, smooth, engaging and a gourmet experience for the palate – all of which makes Beaujolais an excellent quaffing wine. Imagine a ring of church towers, 38 villages in the Beaujolais-Villages appellation following the ample curve of the hillsides and drawing on the best of the qualities which have made it so famous and successful! Most of this AOC lies in the middle part of the Beaujolais winegrowing area, between the river valleys of the North, the Saône valley and the Beaujolais Mountains, thus giving the wines an elegant, suave typicity which varies from one geographical area to another. The winegrowing area covers silty sands, as in Saint Etienne des Oullières, the birthplace of the Beaujolais-Villages Nouveaux and then, towards Arbuissonnas and Le Perréon, we come across hillsides of varying steepness and mainly made up of granite. The best Beaujolais-Villages come from terroirs which give them their radiant personalities. So, for instance, the hillsides of Lantignié and Quincié are made up of stonier sandy loam soils, which come from crystalline rock. There is a great deal of schist on the beautiful but very steep hillsides of Beaujeu and near us lies the village of Lancié where, according to the vinification of its wines, we can produce good primeurs or excellent vins de garde, and our own vinification site is in this commune. Beaujolais Villages have a sparkling ruby red robe, with cherry or garnet glints, and their noses reveal aromas of red and black fruits dominated by strawberry and blackcurrant. These are fruity, elegant, charming and deliciously supple, meaty wines – the very quintessence of Beaujolais. The discovery of the remains of a Gallo-Roman villa which once belonged to a Roman nobleman called Reginus gave his name to the commune. The I.N.A.O. (Institut National des Appellations d’Origine) recognised the high quality of Régnié wines and it joined the other nine famous Beaujolais Crus in 1988. As described by a local historian, Régnié-Durette offers itself up to three suns. Visitors can easily recognise this Cru from afar because of its church with two steeples. Towards the north, the relief rises above a coomb, so that from the east, south or west, the great sun lights up all of the plantations. The subsoil comes from the disaggregation of the pink granite and these sands and small granitic stones contain a variable proportion of clay. Régnié wine offers a cherry red robe, which is highly characteristic of Beaujolais wines, and offers scents of small red fruits; it also has melted, fine tannins and is a pulpy wine full of generous fragrances. This is the most spring-like of the Crus – a wine full of charm with the most delicate, sensual flowery, fruity scents. The Chiroubles appellation backs onto the Beaujolais Mountains and is the highest-lying of the Beaujolais Crus, reaching an altitude of up to 450 metres. Traces of this village – under the name of Charoblas – can be found dating as far back as 1169. Chiroubles comes from thin, fairly shallow and remarkably uniform granitic soils. The Gamay rootlets go off searching within the innermost strata of the “gore”, the detritic sand which provides Chiroubles with its velvety texture. This is a soft, delicate gourmet wine, giving wine-lovers the pleasant sensation of sliding small red fruits into their mouths and crunching them. When they reach the village square, travellers will find a statue of Victor Pulliat, a French ampelographer who was born in Chiroubles in 1827. Victor Pulliat’s recommendations on winegrowing in Beaujolais included using grafting to combat phylloxera (a fearsome aphid which made its first appearance in France in 1874). The Cru festival was held for the first time in 1980 and is traditionally preceded by the Victor Pulliat competition for the vintage’s best wines, in each of the 10 Beaujolais Crus. Mont Brouilly has a very wide range of soils from a variety of geological terrains; this hard, blue-mottled rock is of volcanic origin and is made up of quartzites and metadiorites. The rock of Mont Brouilly is rich in green minerals and was partially affected by the introduction of the granite from the Grands Crus region, hence the name «corne verte» (green horn) by which it is sometimes known. It is also known locally as «la Pierre Bleue des Brouilly» (Brouilly Blue Stone) because of the pretty bluish glints taken on by the altered rock. This mineral soil is full of character and provides the vineyards with a terroir of exceptional quality. At the top of Mont Brouilly stands a Chapel housing the Vierge au Raisin (Virgin with Grapes), an advance guard who has been positioned there to turn away the frost, hail and other scourges of all kinds which afflict the vine, which is the whole area’s raison d’être. Côte de Brouilly, a wine ripped out of this unique blue rock, draws on all its depth and strength. The nose is complex and asserts itself in the mouth, where the fruit is sustained by a remarkable mineral quality, so this is a wine with quite a personality! The vines of the most sprawling (1,300 hectares) of the Beaujolais Crus flourish at the foot of Mont Brouilly, a hillock with an exquisite chapel standing on top of it. So it is hardly surprising that, when you pour it out, you see the glass lit up by wine whose roundness undulates as gently as the hills where it was made. The Brouilly appellation accounts for approximately 20% of the volume of Beaujolais Crus. 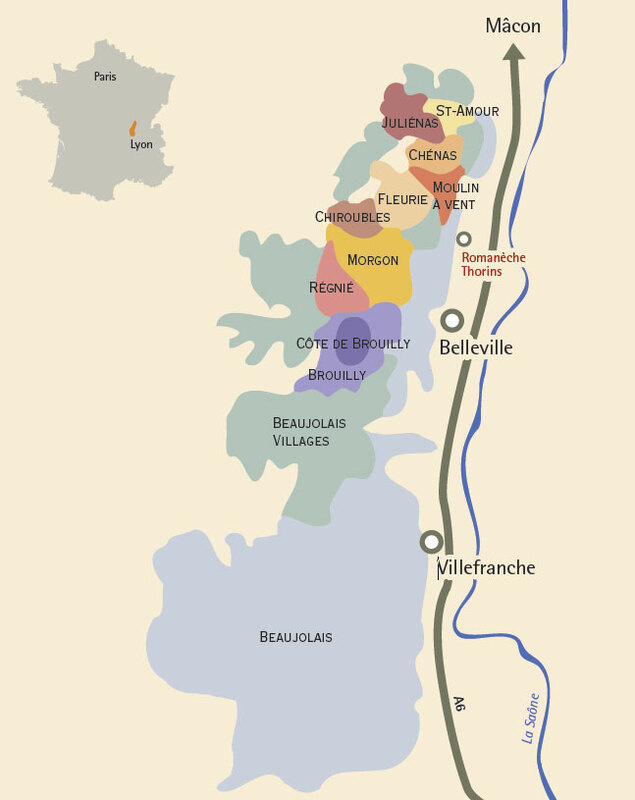 Brouilly is produced in six communes – although none of them actually bears the name of the appellation – Cercié, Saint Lager, Charentay, Odenas, Saint Etienne la Varenne and Quincié. The soils are thin, acidic, dry and not very fertile, and offer different characteristics which vary from one area of the appellation to another, each imprinting their own character on the wines: pink granite, diorite, marl-limestone substrates, crystalline detritus and fine clayey elements. There are many Châteaux within this appellation, including the Château de Nervers, the Château de la Tour, the Château de Pierreux and the Château de la Perrière. Brouilly wines deliver a deep ruby robe with very pure aromas of small red fruits, plum and subtle mineral notes, and their melted silky tannins offer finesse and harmony in the mouth. The name Chénas is said to come either from the fact that the site was once planted with oak trees (Cassanus in Gaulish) or else from the name of a Roman nobleman (Canus). Chénas is the rarest of the Beaujolais Crus with just 270 hectares of vineyards. From the upper parts of the appellation, including the Pic Rémont which juts out over it, the soils are of granitic origin with clay-bonded and stony sectors on the surface. Chénas has a garnet robe, aromas of black fruits and flowery scents of peony and rose with subtle spicy and woody notes developing as it ages. It is a generous, well-structured, fine thoroughbred of a vin de garde. Chénas is said to be “a bouquet of flowers in a velvet basket”. Even though Chénas is the most unassuming of the Beaujolais Crus, it is still perfectly typical of the Beaujolais terroir, and this can be seen in its soil, its hamlets, its own special magic and its wines which are able to age without a wrinkle, Burgundy-style. Chénas gives off a wonderful smell redolent of the intimacy of life in a typical village in the area, which was once administered by a principal tax collector, one M. de la Hante, who bequeathed one of the finest arched cellars in the region to the cooperative. The Fleurie Cru benefits from the site’s own unique geography, with hillsides backing onto the Avenas, Durbize and Labourons chain of peaks; Fleurie is made up of two separate areas: in the higher part of the appellation, at the foot of the Chapelle de la Madone which overlooks the Cru and offers an amazing panoramic view, the soils are thin, acidic and arid. Below the market town, the terrains are deeper and more clayey. The whole of the Cru is produced in the commune from which it takes its name. The Cru has 13 different vineyards listed by the I.N.A.O., each of which is a terroir producing a highly characteristic type of wine. So, going consecutively from the north to the south of the appellation, we have Les Roches, Poncié, Les Moriers, La Roilette, Les Garants, Mongenas, La Madone, La Chapelle des Bois, Les Côtes, Le Bon Cru, Champagne, Grille-Midi and La Joie du Palais. Fleurie gets its intense carmine red robe, its fruity, flowery aromas, its elegance and finesse and its silky tannins from the pink granite soil. All these subtle nuances and fragrances produce wines which, because of their natural refinement, are sometimes known as the «Queen of Beaujolais» to underline both how different they are and their delicate sheen of nobility. Together with Chénas, Saint Amour is the most confined of the Beaujolais Crus. The decree for the Appellation Contrôlée Saint Amour was published in 1946 especially thanks to the work, thoroughness and love of winemaking of a self-taught shepherd-turned-winegrower from humble origins by the name of Louis Dailly. The vines of Saint Amour stand on granitic and flinty clay soils. The clays coat the rocky, stony parts which come both from granite and arkose and from schist. The Côte de Besset, Les Champs Grillés, Le Clos de la Brosse, Le Clos des Guillons, Le Clos des Billards, Le Chatelet, La Folie, En Paradis and Le Clos du Chapitre vineyards are particularly well-known. Obviously, with a lovely name like Saint Amour (literally meaning «holy love”) they come into their own on Saint Valentine’s Day, with an unmissable special wine for lovers. A Saint Amour can be soft, with very marked aromas of red fruits, vine peach and peony. In order to give the wines structure, the winegrowers can employ techniques which consist of soaking the grape in the juice during fermentation, known as “grillage”, “delestage” or “remontage”. So you may then be surprised by the Saint Amour’s power, body, structure and the aromas of kirsch, spices and reseda. Irrespective of the vinification methods used, Saint Amour always combines elegance and finesse, making it the perfect wine for Saint Valentine’s Day. Juliénas is the most northerly of the Beaujolais Crus and its name apparently comes from Julius Caesar who is said to have passed through the region… “Julius is here”. The parent rock is highly granitic, disaggregated on the surface, with partly pink granite but also some schist. These are well-drained, poor soils, and this means that they are excellent for viticultural purposes. Certain vineyards under the names of Les Chers, Les Mouilles and Les Capitans are particularly well-known. The latter has rich soils allowing it to produce a rich, full wine. The wines of the Château des Capitans, one of the jewels in this appellation’s crown, are full, meaty, powerful, thoroughbreds, raising a monument to the glory of the Gamay grape. This Juliénas Cru bears the hallmark of the greater diversity of the terrains, offering great complexity with flowery, fruity notes delicately enhanced by spicy, peppery notes. Juliénas is a robust and well-structured, elegant and seductive wine, offering a fine capacity for ageing. The Confrérie de Saint-Juliénas des Prés has been holding its spring chapter meeting in the square in Saint-Germain des Prés at the foot of the church of the same name since 1992. The winegrowing area lies exclusively in the commune of Villié-Morgon, in the north of the department of the Rhône. The Morgon Cru is the second largest in area after Brouilly, and backs onto the Beaujolais Mountains with a south-eastern exposure, thus giving it the perfect amount of sunshine. The soils, which are made up of sands which come from the decomposition of the granite, are known locally as «roches pourries» (literally “rotten rocks”). One special local feature is an unusual mass which has created a hump known as the Côte de Py. Les Charmes, Le Py, Douby, Corcelette and Les Grands Crus are the best-known terroirs here in the AOC Morgon. This Cru is such a wonderful expression of its terroir and the complexity of its constituent parts that in French we sometimes describe it using a special word all of its own – we say that it is “morgonne”. So we need to stress its close ties to the soils from which it is produced, the famous “rotten rock”, its location and the exposures of the various areas of the Cru. The robes of Morgon wines vary between carmine and deep garnet and the aromas are to be found somewhere towards stone fruit, especially cherries. Over time, well-structured wines will develop scents of ripe fruit and kirsch. Morgon is structured, powerful, rich, meaty and can be kept for a long time. The appellation takes its name from an old windmill in the centre of the winegrowing area which was used to mill grain right up until the mid 19th century. The blades were torn off by the storm in January 1910 and had not been replaced but then the mill got its blades back and was restored to working order to mark the 75th anniversary of the Moulin-à-Vent appellation, celebrated on 12th June 1999. The appellation was demarcated and recognised on 17th April 1924 and covers an area stretching across two communes: Romanèche Thorins in Saône et Loire and Chénas in the Rhône. Nourished by pink, friable granitic sand known in French as “gore” or “grès”, with seams of manganese running through them which are probably making what make the wine so special, the Moulin à Vent has a nose exuding aromas of blackcurrant, withered rose, vanilla and spices. In the mouth it is a structured, tannic, complex wine; this is the vin de garde par excellence and can be kept for 10, 15 or 20 years – and sometimes even longer, depending on the vintage – and it is said that with age it develops aromas of cherry, morello cherry and truffle, thus bringing it closer to its Burgundian neighbours. The best-known sectors of this Cru include Carquelin, Champ de Cour, La Rochelle and Roche-Grès. Can David slay Goliath in the world’s vineyards?